All our operations are based and run out of Nepal. We control the production process from start to finish, maximizing transparency and social impact. We love Nepal and love what life amongst Nepalis looks like. We are proudly transparent in our production processes and want to emphasize our roots in Nepal. After all, this has been home for Dinadi since the start and the hope to bring lasting impact in Nepal has been a big driving force since the very beginning in 2016. Nepal is characterized by it’s beautiful and welcoming people, it’s high mountain peaks, busy Kathmandu and a rich culture that in many aspects remains completely untouched. Squeezed in between China and India, Nepal inherits such variety in culture despite its humble size. With at least 123 different ethnic groups you will find just as many different languages, internal cultures and traditions, architecture, and general craftsmanship. Diverse Nepal is everything from quiet mountain villages to the bustling inner city and its polluted skies. 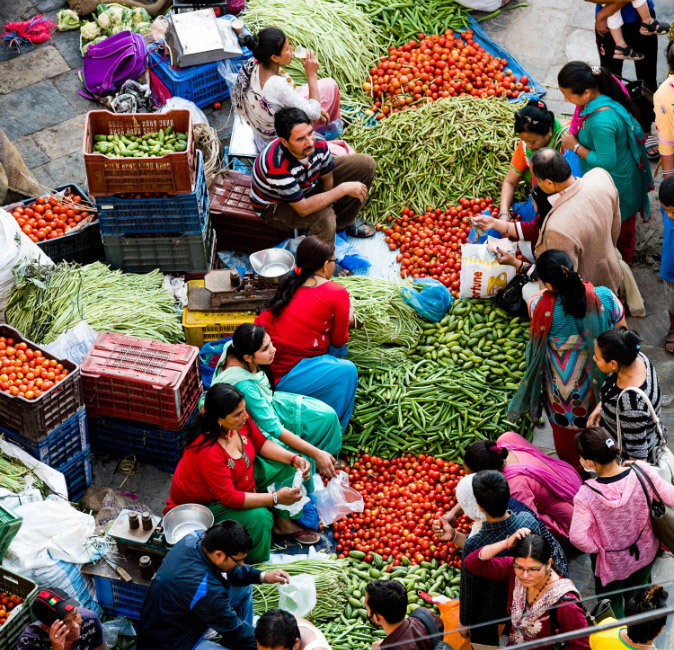 Somehow in the midst of diversity, we find ourselves repeating “that is so typical Nepal”. Some characteristics are unmistakable. At the top of the list is the hospitable Nepali nature. Across Nepal when you meet a Nepali you can be sure to be greeted with a “Namaste” and followed by an invitation into a family’s home for a meal of their national dish; Daal Bhat. Nepal is one of the poorest countries in the world, leaving many people vulnerable to exploitation. Every year alarming numbers of Nepali girls are trafficked to brothels in India where they are sexually exploited and forced into involuntary servitude. Many children in Nepal, especially girls, are deprived of even the most basic form of education, usually due to lack of family finances. Due to a lack of opportunities in Nepal, unskilled workers leave the country in masses searching for work. They often find themselves in situations where they are exploited and taken advantage of. With gender discrimination being a tangible issue in Nepal we set out to provide opportunities specifically for women. We have fortunately been privileged to grow up in parts of the world where women are treated with dignity and respect and where women’s rights are continually revised and improved. Equality is key, and it is a fundamental human right to have a voice in the society. Unfortunately, that is not yet the reality we see in Nepal. The extreme poverty robs many Nepalis of options and opportunities and leaves many in the enslaving cycle of poverty. With unemployment rates close to 50% the cycle can at times seem unbreakable. Add to that the hierarchal caste system and a cultural mindset that favors men, life is simply put just not easy for many, especially women. The level of difficulty brings desperation and leads to a country with extreme numbers of Nepali’s living abroad; either for labor work or because they have forcefully been trafficked. Exploitation is a sad outcome of the lack of opportunities in Nepal. We are convinced that social entrepreneurship is the way to bring lasting change to developing communities. Through employment, we want to support each individual employee to become financially stable while increasing Nepal’s productivity and export numbers and through that play a part in Nepal’s overall economic growth. We aim to install a mindset of equality in our Dinadi culture where each woman is celebrated, included and valued. Rather than a handout Dinadi is an opportunity to provide for oneself in a dignifying way.